Servitization and digitalisation are global trends upending many sectors. Transport and mobility are no exception. Decreasing dependence on private vehicles has been high on the political agenda in recent years. The needs and habits of travellers have also evolved, and there are increasing demands for more flexibility in their mobility options. Simultaneously, a growing number of shared mobility services namely car sharing, moto sharing, motorbike sharing, demand-responsive transit, carpooling, etc. are progressively becoming commonplace in cities worldwide, serving new consumer needs and life styles. The Mobility as a Service (MaaS) concept stems from the above mentioned trends by combining new mobility services with public transport in a meaningful and seamless way. It holds the promise of providing convenient, private vehicle-free options for door-to-door mobility, while also adhering to public policy goals, such as sustainability, affordability, and social inclusion. In the process, the traditional model of mobility service providers working in isolation is slowly being abandoned. Mobility as a Service implies a complete paradigm shift in the way transportation services are distributed and business models are run, posing a challenge for well-established stakeholders and incumbent operators of transport services. It is also a great opportunity for new entrants, who are set to disrupt the rather traditional sector of transport and mobility and generate new opportunities, both from the perspective of policy makers responsible for mobility management, and business-wise. The momentum for Mobility as a Service is high in Catalonia, with a burgeoning local ecosystem in which the public sector is developing very ambitious initiatives and projects in the field, with a bunch of private companies that are already providing new mobility services, and many other that are planning to enter the market. Great attention and interest have been focused on MaaS in recent years, at European (notably, with the leading MaaS Alliance) and some national levels, but this has not yet replicated locally, in Catalonia. While there are already a number of forums tackling mobility topics at local level, no single initiative is clearly and specifically aimed at discussing and pushing MaaS forward, in a coordinated manner, in Catalonia. This is what MaaS Catalonia is set to represent. MaaS Catalonia is taking shape as a public-private initiative promoted, initially, by the following pioneering stakeholders: Altran, Applus Idiada, CARNET, CIT UPC, Creafutur, Edenway, Factual, Ficosa, Justmoove, KINEO, Pildo Labs, PTP – Promoció del Transport Públic, RACC, Rücker Lypsa, Saba, Seat, Sensefields, Shotl, Universitat Politècnica de Catalunya and XMOBA. The main goal is to foster MaaS development and deployment in Catalonia. All in the broadest sense: Mobility as a Service should be taken as a vision and a reference framework, that will lead to many promising synergies and open up opportunities, as it is composed of building blocks worth discussing, developing, and evolving, always with an open-minded and collaborative approach. In addition, international cooperation and global reach is sought from the very beginning, to generate and share knowledge and create new opportunities for all stakeholders on board. “Catalonia and its capital, Barcelona, are great living labs for innovative mobility projects. Barcelona is the designated Mobile World Capital until 2023, it is host of many renowned international congresses, a world-renowned smart city, and one of the leading hubs for technological startups in Europe. We’re set to embrace the MaaS challenge.” – Daniel Serra, Project Manager, CARNET. “MaaS Catalonia will promote awareness and constructive reflection among city and regional authorities about how to best take advantage of the MaaS momentum, and encourage communication and cooperation between new mobility services, tech companies, startups, MaaS providers and local/regional government, while extending the reach and knowledge sharing with the international transport and mobility arena. We’re excited to help shape MaaS in Catalonia.” – Martí Jofre, CEO, Factual. 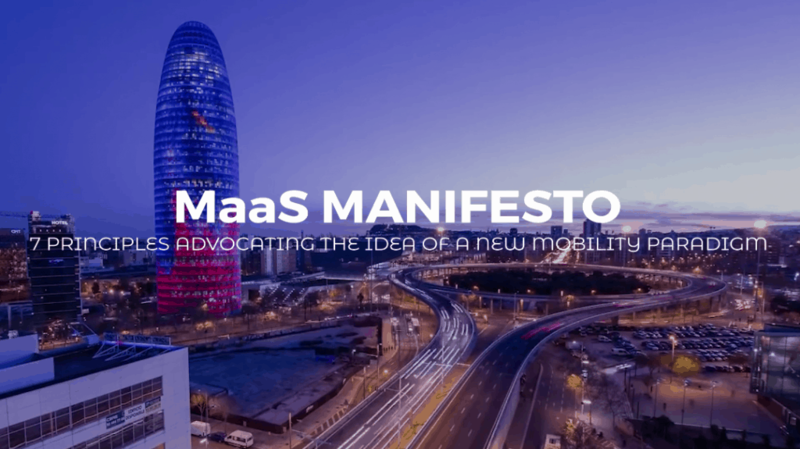 In this favourable context, MaaS Catalonia kicks off its activity and launches the MaaS Manifesto, which sets out 7 principles advocating the idea of a new mobility paradigm. The main objective is to raise the interest of the widest spectrum of stakeholders in the MaaS ecosystem, not only in Catalonia but at international level, and provide a space to openly discuss the several aspects that are critical for developing the new MaaS paradigm to its full potential. MaaS Catalonia encourages everyone interested – individuals, companies, organizations – to sign it and help spread the word. Want to submit an article to BusinessMaas? Get in touch using our contact form or tweeting us at @BusinessMaaS.